WILLEMSTAD - The navy ship Zr.Ms. Zealand intercepted 600 kilograms of cocaine in the Caribbean Sea this week. The ship had just left from Curaçao to the Netherlands after a mission of four months as a station ship in the Caribbean. 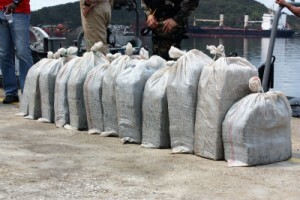 Twelve bales of cocaine were picked up from the sea. The three occupants of the go-fast were arrested and handed over to the local authorities in Curaçao. The DASH 9, maritime patrol aircraft of the Caribbean Coastguard (KWCARIB) detected Sunday during a patrol a suspected go-fast 'northeast of Bonaire. The Rescue and Coordination of the Coast Guard Curaçao Center (RCC) informed this to Zr.Ms. Zealand which shifted its course. When the navy ship arrived it found the suspect vessel with three people on board. The Zeeland immediately dispatched the NH-90 helicopter gunship and two maritime interceptors. The NH-90 forced the suspect vessel to stop by using warning shots. The crew then threw their cargo overboard and tried to escape. But they did not succeed. The fast boat was finally brought to a halt. After a search, 12 bales of cocaine were fished out of the sea. Zr.Ms. Zeeland then returned to Curacao. Here the crew and the contraband were handed over to the local authorities. The navy ship then set course back to the Netherlands. Zr.Ms. Zeeland has spent the past four months as a station ship in the Caribbean. During this period, the ship played a key role in providing relief to the Windward Islands and Dominica after hurricanes Irma and Maria. Zr.Ms. Van Speijk will replace Zealand as the station ship. This ship arrives on November 10.